Lenovo is going beyond smartphones and tablets with Android, putting the operating system in a unique 28-inch 4K smart monitor and a new, 19.5-inch all-in-one PC. The ThinkVision 28 is the first 4K monitor to be offered with Android, while the N308 all-in-one PC, which starts at $450, provides an Android alternative to Windows PCs. Android brings a familiar mobile user experience to desktops, with the ability to run apps and games and share files between devices, Lenovo officials said. People are accessing more applications, entertainment and storage services over the Internet, and Android is designed for that type of computing, said Nick Reynolds, a Lenovo executive director of marketing. The addition of Android to a 4K display is unusual; the OS is usually found on lower-resolution smartphones and tablets. 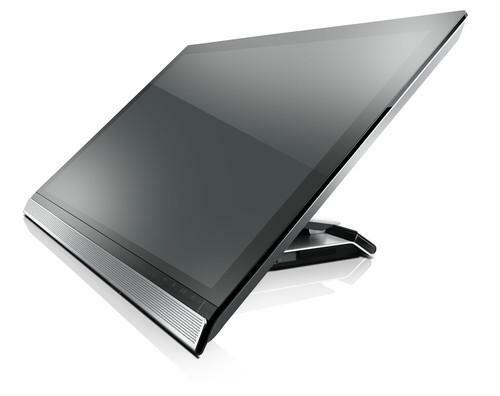 But the ThinkVision 28 is a professional 4K monitor first, and can be used as an Android desktop when needed, Lenovo said. The display has three HDMI ports, one Displayport and five USB 3.0 ports. "Now you get a very high resolution display that you can use for work situations, as well as being able to have an Android interface that can access applications," said Matt Bereda, a Lenovo marketing director. The ThinkVision has an Nvidia Tegra processor and a stock version of Android, and can access games from Nvidia's TegraZone service, a Lenovo spokesman said. There are no plans for a customized user interface similar to the one in Lenovo's tablets and smartphones. "There are base Android apps installed, similar to what you'd get with your phone. You can expect a similar interface. Kind of the baseline video, camera type of apps, but then you will also be able to download others," Bereda said. The ThinkVision 28 can also wirelessly access data from Android smartphones and tablets. Lenovo didn't disclose the price of the ThinkVision 28 but said it will ship in April. The N308 is being pitched as a supersized tablet and an alternative to Windows 8.1 all-in-one PCs. It runs on Android 4.2 and the components are encased in a 19.5-inch touchscreen that can display images at a 1600 x 900 pixel resolution. "This is something different from the traditional all-in-one," Reynolds said. "We see this as a great device for people who want a very affordable all-in-one." The N308 is for people who want to browse the web and use apps they're familiar with from their smartphone, Reynolds said. "You can use it in your house like a very large tablet and move it around," he said. The N308 is 32.88 mm thick, runs on a quad-core Tegra 4 processor, has 500GB of storage and includes a webcam. A battery will be integrated in North America models, but will be optional in other parts of the world. A shipping date wasn't provided.